STOP and read this page before selecting your tunes. Just like all electronically sent goods, once your tunes are sent through email they are NON-REFUNDABLE. Please cancel your order now if you are not okay with our no return policy on MPT tunes. 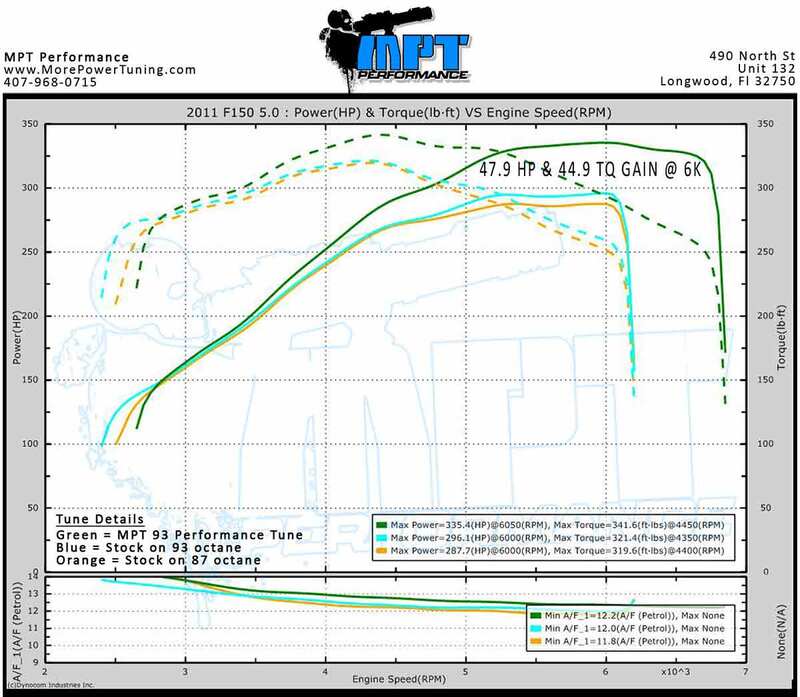 PR-X is our top-performance tune for the 2011-14 F150 5.0 with a dyno proven gain of 47.9 HP and 44.9 ft-lbs of Torque on the 5.0L. Due to the impressive power gains and performance mannered driving, this is by far the preferred tune for the 11-14 F150 5.0 truck. The MPT PR-X is all about performance, but is absolutely a daily driver. The truck feels so much lighter with the increased throttle response and part throttle power. Wide open throttle power is noticeably increased as well. The power band carries past the factory shift points and rev limiter so this is adjusted in the MPT Performance Race tune. With this tune you are looking at huge increases in low end torque and acceleration, faster 0-60 times, quicker 1/4 mile results and shift points optimized with a focus on performance. Shifts are designed to be firm, crisp and fast, but still mild mannered at lower throttle positions. Shifts will happen at a higher rpm/mph when throttle position is increased. Tow-Haul mode retains factory elements, making it an option to tow with this tune, but there is also a tune specifically designed for towing. If you want to go to the track, you should select one of the Performance Tunes with the highest octane available in your area. 93 Performance Race or 93 Performance Street recommended. E85, E30 or any other blend of E85 fuel: If your F150 5.0 is flex fuel then you can also run the tunes with a mix of E85 or even full E85. This will definitely result in better performance and an even bigger horsepower increase. This tune has all the benefits of the above PR-X but has the trans setup just like Ford did from the factory. If you prefer the early shifts that are barely noticeable and like being in a high gear at a low mph, this is an option for you. The Performance/Towing tune is a step down from PR-X. Designed to be a performance tune and a towing tune hybrid. The normal shift schedule is a blend of stock shifts at lower throttle then with increased pedal it will hold the gear longer. Downshifts are improved over stock but are not as aggressive as PR-X. The tow-haul mode is slightly modified but retains the factory design for the best towing experience. The firmness of the shifts are increased over stock but will also be a step down from PR-X. Throttle response and part throttle power are ever so slightly decreased from the PR-X but will still be a noticeable improvement over stock. If you are towing any significant weight or load then this is the tune we recommend using. Performance Towing tune retains the factory rated towing capacity. If you are wanting to hit the drag strip, Performance Tow is not going to have the best overall time. This is a blend of Performance and Towing. The straight performance tunes are the way to go if you want to hit the track. 93 PR-X is the recommended tune for the track. Also, don't forget you can run full E85 or even a blend as long as your truck is flex fuel. This tune has all the benefits of the above Performance Tow but has the trans setup just like Ford did from the factory. If you prefer the early shifts that are barely noticeable and like being in a high gear at a low mph, this is an option for you. This tune can be used with any octane fuel, the concept behind this tune is to take the improved shifting and performance tune but leave spark, fuel and other items stock. Throttle response and part throttle acceleration will still have a noticeable increase over stock. The Perf-Econ tune, also known as Performance Economy Hybrid is a perfect blend of low end fuel economy and top end power. This tune keeps the closed pedal and very low throttle positions controlled to make sure fuel economy is optimized. Shift points at lower throttle positions will be slightly sooner than stock to get you into higher gears faster. Then it also has improvements on power and throttle response at higher pedal positions. Great tune for those that want the option for power but don't want it full time. Due to the earlier low throttle shifts, this tune may lug some. If you don't like feeling or hearing converter lug avoid this tune. If you can accept better fuel economy with the side effects, then this is the tune for you. Tow-Haul mode retains factory settings on the Perf-Econ tune. This tune has all the benefits of the above Perf-Econ but has the trans setup just like Ford did from the factory. If you prefer the early shifts that are barely noticeable and like being in a high gear at a low mph, this is an option for you. Octane: Gas vehicle tunes are heavily impacted by the octane of fuel being used. Running a higher octane allows us to advance the spark more which results in better performance. That being said, you should pick tunes for the octane you plan on running. If you always have and always will run 87-89 octane, then that is what you should choose. You can run a tune for 87 octane and fill the tank with 93, however you cannot run a tune for 93 octane and fill up with 87-89. Doing so will result in knock activity, a loss of power output and in rare cases, possible engine damage. Our recommendation for performance tunes is to run the highest octane available. If your truck is Flex-Fuel then you can run an E85 mix or full E85 on any of the octane ratings. The higher the octane rating of the tune the bigger the increase in power will be. Aftermarket Cold Air Intake: If aftermarket, enter brand and model of the CAI. Aftermarket Throttle Body: If the truck has an aftermarket throttle body, indicate the details on the form. Aftermarket Intake Manifold: If the truck has an aftermarket intake manifold, indicate the details on the form. Thermostat: If you have an aftermarket thermostat, enter it here and your fans will be updated.